Once again I was out for a run wearing a new pair of orange shoes (Keen A86 TRs) and I ran past two elementary school girls and one said, "Nice shoes," as I ran past. This is not the first time people have commented on my shoes. The past few months in Wisconsin I raised quite the gossip by wearing seemingly different brightly colored shoes every day. It's funny. If given the choice between black, white and a bright color like orange or green I almost always go with the bright color, but it's not about the color of the shoes. I would wear a show of any color, even pink and purple polka dots, although it would have to be a good shoe. There is a lot of reason to why I run in so many different shoes. Some of my shoes are for different purposes. I have Vibram Five Fingers for slower recovery and regeneration runs that are barely more than a walk. I feel that barefoot is totally the way to go. Had I know that 12 years ago I would have done nearly everything barefoot, 20 years ago would have been better. Alas, my legs are weak and I can only handle up to about 45 minutes in the Vibrams. I have a number of strait up racing flats, the Saucony A2s and A4s. These are for faster paced training like workouts and long runs. I have a pair of Saucony Fastwitch 3, 4, and 5s in the picture above. They are light trainers and it has been my "go to" shoe for almost two years but they excel at workouts and long runs. 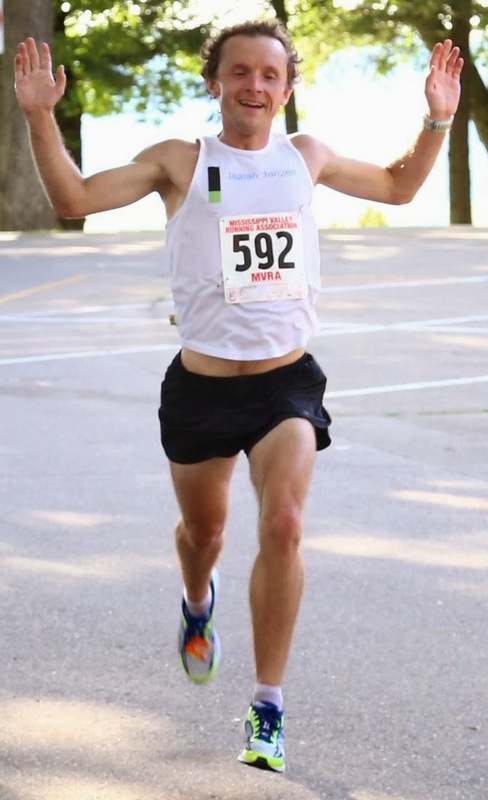 I have set a personal record in the half marathon twice in Fastwitches. Although, I just got the 5s and I am afraid that they ruined the best shoe ever made for my foot. We shall see after I get some miles put in it. I have a pair of Keen A86 TRs (the orange ones in the photo) because I got a good deal on them, but as it turns out they are becoming my "go to" shoe because the tread is made for trail running so it's really durable and there is hardly any arch support (which is good unless you like injuries). All of my Sauconys have holes in the sole so any puddle means you get wet, the Keens can handle like 3/4 inch of puddle which is a big advantage (sure call me afraid to get dirty and wet, it's somewhat true). Then I have a pair of Newton Distance Ss which I got with a big discount at their store in Boulder. I am not a fan of shoes that separate me from the road, but these are by far the best high heel shoes for running that I have ever worn. I also like them best with my YakTrax when I am running on ice and snow. I typically rotate through shoes so that every pair has two days to air out before I wear it again otherwise you can get really smelly shoes. Also, running in a wet shoe is a recipe for blisters. So there you have it. I have a bunch of shoes. I probably go through 6-8 pairs of shoes a year. I typically put 500-600 miles on every pair of my shoes. Usually around that time I start to get knee pain from running in them. It depends on the shoe though. Some I have only gotten 400 miles out of and I am pretty sure I hit 700 miles on at least one of my pairs. Sometimes I get 150 miles into a pair of shoes and it starts causing me problems so it's basically a loss of money. That's when I am on my sixth pair of Saucony Fastwitches and third pair of As. 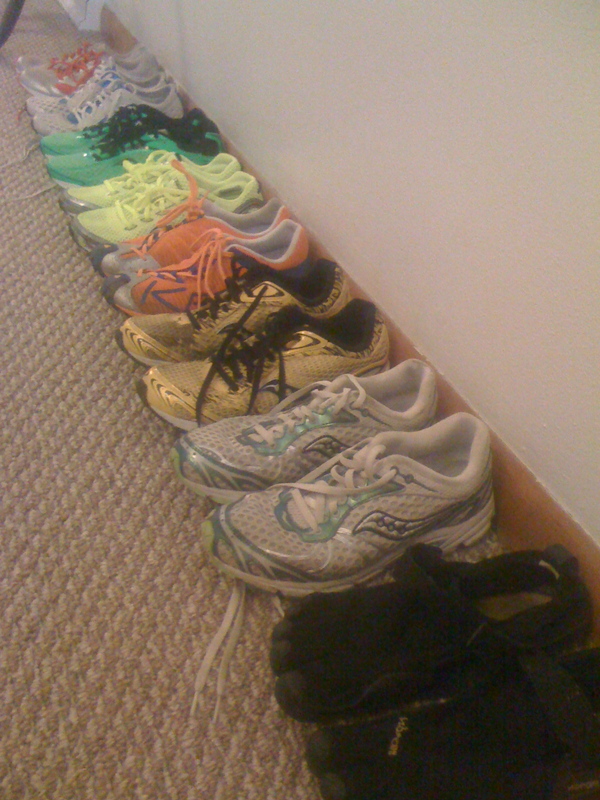 I am not restricting myself to Saucony it just happens that in 2009 and 2010 their shoes fit my feet really really well. Although, these Keens are pretty awesome. So there you have it, eight pairs of shoes that I am currently using. This doesn't include my track or cross country spikes or my mountain climbing boots and rock climbing shoes or dress shoes. In total I have around 20 pairs of footwear to choose from for any "adventure". It all starts with your feet. They are a really important aspect of the biped movement system. It is to my advantage to take care of my feet and use the right tool for the job at hand wether that is running 5k around a track or 30 miles on rail trails or going from camp 2 to camp 3 at 23,000 feet.